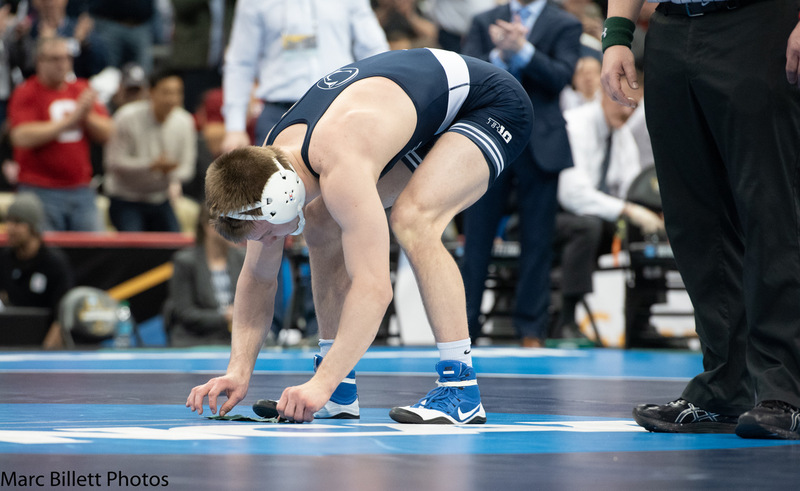 Penn State’s dynamic duo of Jason Nolf and Bo Nickal joined an exclusive club at the NCAA Division I Wrestling Tournament, which concluded Saturday night at PPG Paints Arena in Pittsburgh. Both hit the trifecta by winning a third consecutive NCAA Division I title, Nolf at 157 pounds, and Nickal at 197 pounds. They are the 51st and 52nd wrestlers in the 89-year NCAA history of the tournament to win three or more titles. Four members of the group are four-time champions: Pat Smith (1990,91,92,94), Iowa State’s Cael Sanderson (1999-2002), Cornell’s Kyle Dake (2010-13), and Ohio State’s Logan Stieber (2012-15). The other 48 members of the group, which now include Nolf and Nickal, are three-time champs. Nolf (31-0), a Kittanning graduate, made his fourth appearance in the finals and claimed his third title with a 10-2 major decision of Nebraska’s Tyler Berger (28-4). Nolf finished his career with a 117-3 record and holds Penn State’s record with 60 pins. Nickal (30-0), like Nolf, made his fourth consecutive appearance in the finals and claimed his third title with a 5-1 win over Ohio State’s Kollin Moore (23-2) at 197 pounds. Nickal concludes his career with a 120-3 record, which included 59 pins. Both also celebrated Penn State’s fourth consecutive team title. It was a unique ending to their careers – careers they started together back in 2014. Like Jason Nolf, Nickal spoke of being blessed on Saturday night after his third National title. Nittany Lions teammate Vincenzo Joseph had a chance to join Nolf and Nickal as three-time champs, but came up short. Joseph (27-2), a Pittsburgh Central Catholic grad who was seeded No. 2, made his third consecutive appearance in the finals, but dropped a 7-1 decision to Virginia Tech’s Mekhi Lewis (28-2), who at No. 8 was the lowest seeded finalist. Lewis broke a scoreless tie with four nearfall points midway through the second period, then added another takedown in the third period. Joseph is only a junior, so he still has one more chance to become a three-time champ. Iowa’s Spencer Lee, Cornell’s Yianni Diakomihalis and Arizona State’s Zahid Valencia will also have that opportunity next year. Spencer Lee, a Franklin Regional graduate, won his second title at 125 pounds with a 5-0 win over Virginia’s Jack Mueller. Diakomihalis won his second title with a 6-4 overtime win over Ohio State’s Joey McKenna at 141 pounds. Junior Zahid Valencia claimed his second title with a 4-3 win over Penn State’s Mark Hall at 174 pounds.